Rob Wessel studied guitar at the Wisconsin Conservatory of Music for 9 years, in classes and lessons taught by David Hazeltine, Michael Sullivan, John Foshager, and Don Linke. At the National Guitar Workshop, Rob has studied guitar in classes and seminars taught by Mike Keneally, Terry Syrek, Matt Smith, Harry Jacobson and other gifted musicians. Rob has been playing in local bands since the 80's, as well as writing and recording music in his studio. Rob’s original recordings have placed in the finalists in the Musician Magazine Best Unsigned Band competition, and have earned him a scholarship to attend the National Guitar Workshop. 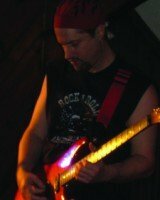 Rob is an experienced guitar, bass, who has taught students in styles ranging from rock and metal to blues and acoustic. Rob teaches all levels of guitar and bass.